Gastroparesis is a disease or disorder of the muscles of the stomach or the nerves controlling these muscles that causes them to stop working - This results in the stomach taking too long to empty its contents into the intestine and an inadequate grinding of food. 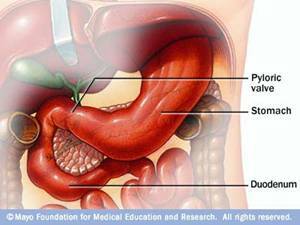 ✔ 35% had idiopathic gastroparesis - i.e. it came out of the blue, and they didn't know why! ✔ Remaining 10% of cases included other miscellaneous conditions - specifically connective tissue diseases, such as scleroderma. Soykan I, Sivri B, Sarosiek I, et al. Demography, clinical characteristics, psychological abuse profiles, treatment, and long-term follow-up of patients with gastro paresis. Dig Dis Sci. 1998;43:2398-2404. Normal Food path from stomach to small intestine - the stomach is a muscular sac about the size of a small melon, that expands when you eat or drink to hold as much as a gallon of food or liquid. The stomach mechanically churns and pulverizes your food while hydrochloric acid (HCl) and enzymes requiring an acid environment break it down. Muscle fibers of the stomach wall create structural elasticity and contractibility, both of which are needed for digestion and propelling food towards the intestines. – Once the duodenum has become strongly alkaline, the pyloric sphincter receives a signal to open, and the partially digested food is released into the small intestines - where most of the absorption of nutrients takes place.